As I’ve touched on before, Sergeant Major of the Marine Corps Carlton Kent visited several Marine commands in Europe last week, including one in Naval Station Rota, Spain. That would be home to the headquarters of Fleet Anti-Terrorism Security Team Europe, better known as one of the Corps’ FAST companies. And like many Marine commands, the unit has its very own mascot: Cpl. Monster. 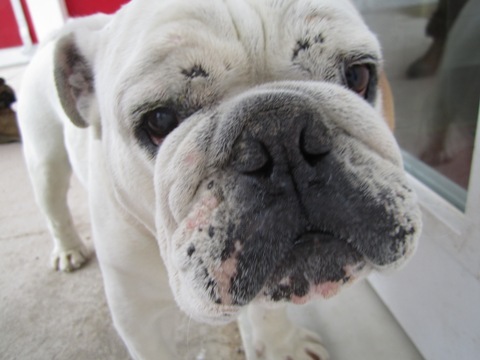 An ornery, but lovable English bulldog, Monster has lived at the FAST headquarters at Rota for years. I met him while Kent received a classified brief on FAST Company’s operations. As you can tell from the photograph above, Monster isn’t shy. What a lovely dog. I am glad he is loved. I used to raise boxers and still have two of them. I am hoping my oldest boxer Sully Sampson lives until my son comes home from Afghanistan. Kisses bull dog. You rock!